Education and training is provided by schools, colleges, universities, private tutors, training centers and other organizations. It is part of the more global business services industry and consumer services industry. While the majority of education is aimed at young people, in many countries there is an increasing trend for education and training throughout life. Rising demand for higher education in developing countries (especially India and China) and increasing adoption of e-learning were key drivers of growth in the market. Primary and secondary education (K-12) is the largest segment of the education market. Globally, about 83% of people complete secondary education over their lifetime, according to the Organisation for Economic Co-operation and Development (OECD). Post-secondary education contributes 34% of overall education spending at $1.6 trillion. About 40% of young adults in OECD countries complete degree-level education. The e-learning market is one of the fastest-growing segments in the education Industry. The global e-learning market is projected to reach $255 billion in 2017, growing at a 23% compound annual growth rate (CAGR) from $166 billion in 2012. Increased internet penetration and devices such as smart phones, laptops and tablets have supported the demand for e-learning. The global tutoring market is forecast to reach $103 billion by 2018, according to Global Industry Analysts. Market growth is being fuelled by parents’ demand to provide world-standard education to their children in order to excel in competitive examinations. The U.S. and China are the two largest education markets in the world. The U.S. has about 14,000 public schools and spends $500 billion on public elementary and secondary education annually. It has a well-qualified population: 19% of people hold a bachelor’s degree and 8% hold a master’s degree, according to the U.S. Census Bureau. The country is a leading destination for education tourism due to its world-renowned institutions and accessibility of technologically-developed higher education institutions. Globally, most education and training is government-provided. The private sector industry is highly fragmented with no single institution having a significant market share. Major companies in the global education and training services industry include Apollo Education Group (U.S.), Career Education Corporation (U.S.), ITT Educational Services (U.S.), Kaplan (U.S.), New Oriental Education & Technology Group (China), NIIT Limited (India) and Benesse Corporation (Japan). Apollo Education Group is a U.S.-based for-profit educational institution. It owns and operates four higher-learning institutions: the University of Phoenix, Western International University, Axia College and the College for Financial Planning. Career Education Corporation is a U.S.-based, for-profit post-secondary education provider. It operates more than 50 campuses in the U.S., with over 50,000 students enrolled. New Oriental Education & Technology Group is the leading supplier in the Chinese education market. 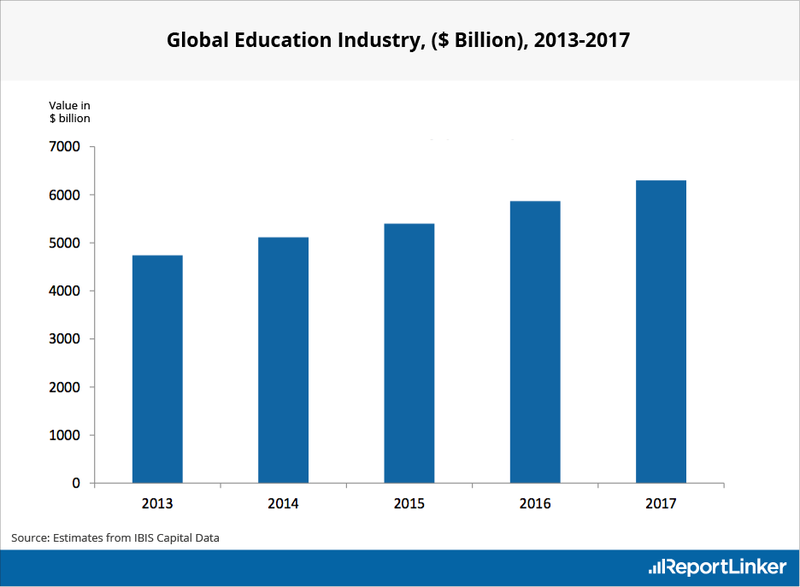 The education industry is forecast to grow at a 7% CAGR from 2013 to 2017 to reach $6.3 trillion, according to IBIS Capital. The market will be driven by increased enrollment. Higher education enrollment globally is forecast to more than double to reach 262 million students by 2025, according to Australian International Education. More than half of this growth is expected to come from China and India alone. Four key trends can be identified in the education market. Adoption of online education is a key trend in the education market. Massive open online courses such as Coursera and edX are attracting millions of users. The e-learning segment will show significant growth due to affordability, flexible learning solutions and demand for workforce training. Education organizations should invest in online education without neglecting the importance of individual interaction and feedback within education. Companies are expanding into the growing emerging market education sectors. For instance, NIIT Limited of India has expanded its presence in China, Indonesia, South Africa, Nigeria, Malaysia, and Vietnam. Companies should take advantage of the opportunity for vocational training and English language, IT and children’s education in emerging markets. The number of students studying abroad is forecast to grow three times and reach 8 million by 2025, according to Australian International Education. Foreign education growth will be driven by the inability of emerging economies to meet the future demand for education domestically. Educational institutions, especially those with strong brand names such as famous U.S. and European universities, should take advantage of this opportunity. The proportion of adults who are involved in lifelong learning is around 10% according to Eurostat, and is expected to increase. Driving factors will be people working for longer and the need for people to reskill to handle the increased pace of technological change in the workplace. Educational institutions should increase their focus on this market.